2018 Fuso Fighter 1627 MAN 8T Tipper "ready TO GO"
GREAT SAVINGS NOW ON READY TO GO STOCK. 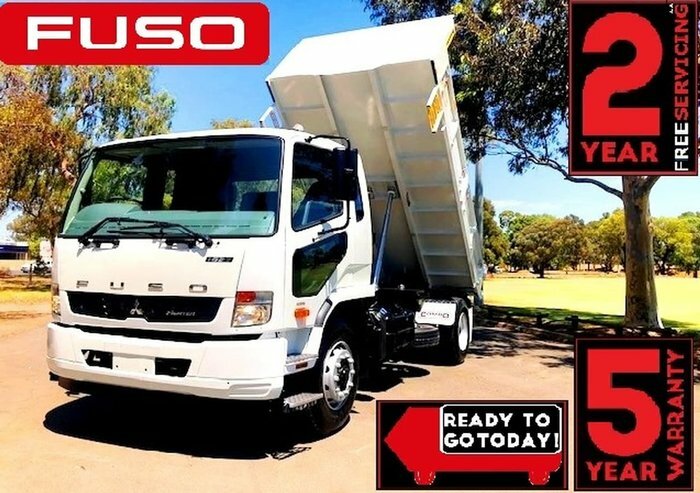 MASSIVE SAVINGS ACROSS THE FUSO RANGE WITH TRUCKS ADELAIDE!! THE BIGGEST RANGE OF READY TO GO FUSO TRUCKS AND BUSES IN AUSTRALIA, WITH FOUR LOCATIONS IN ADELAIDE, MOUNT GAMBIER, MILDURA AND PORT LINCOLN, CALL TODAY FOR YOUR END OF YEAR FINANCIAL FUSO TRUCK OR BUS. FUSO. ALL DAY. NEW FUSO FIGHTER 1627 8T Tipper - 16000kg GVM 25000kg GCM - 270hp Turbo Interooled Diesel - ADR80/03, Euro 5 Emmissions - Easy Drive 6 Speed Syncro Trans - Full Air, ABS Brakes - Cruise Control - Electric Mirrors - Air Cond - Power Steering - Power Windows - Hill Start Assist - Sumo Space Cab - Isri Drivers Seat - Drivers SRS Air Bag - Remote Central Locking - H/D Dropside Tipper Body - Air Operated 2 Way Tailgate - Underbody Hoist System - Tow Hitch - Air Trailer Brakes - Access step & grabrail fitted - Class Leading 30,000km Service Intervals Steel Tipping Body Built by Combo Industries 4.5m x 2.43m x .6m Dropsides. 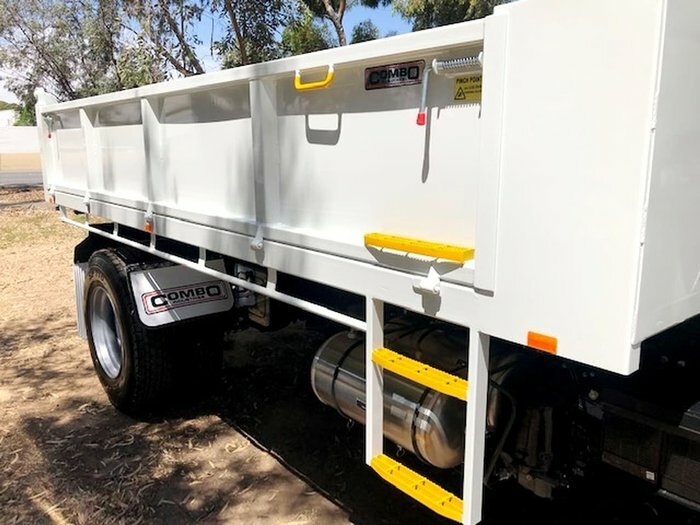 5mm 350 Grade Plate Floor 600mm Steel Dropsides Two Way Tailgate, In Cab Operated. Load Restraint Mount Brackets Only, Tarp Optional Extra. Tow Equipment Optional Extra. Satellite Navigation: Maps with heavy vehicle weight, length, height & hazardous material selectable restrictions with 3 years of Map updates Colour Display: 6.1 inch LCD with touch screen control Phone Connectivity: Bluetooth hands free Audio Visual Entertainment: CD/DVD player and Digital radio DAB+ (also AM/FM for areas not covered by DAB+) USB port for iPod * & other devices Reversing Camera Compatible: Display can accept up to 3 cameras# * iPod compatibility requires an additional licenced cable # Cameras available through spare parts FRESH INTO STOCK!! BE QUICK AND BEAT THE END OF FINANCIAL YEAR RUSH WITH A READY TO GO FUSO TRUCK!! GET INTO YOUR NEW TRUCK QUICKER WITH FUSO FAST TRACK Its simple. If you are a property owner, have been in business for over 3 years and have a clear credit history, you could gain instant approval for up to $250,000 with Fuso Financial*. * Fast Track approval is subject to 60 month maximum term, 30% maximum balloon payment and other lending criteria. Available on new Fuso products only. $250,000 Fast Track approval limit is including, and not in addition to any pre-existing financial exposure. Call one of our friendly Sales Team today! !